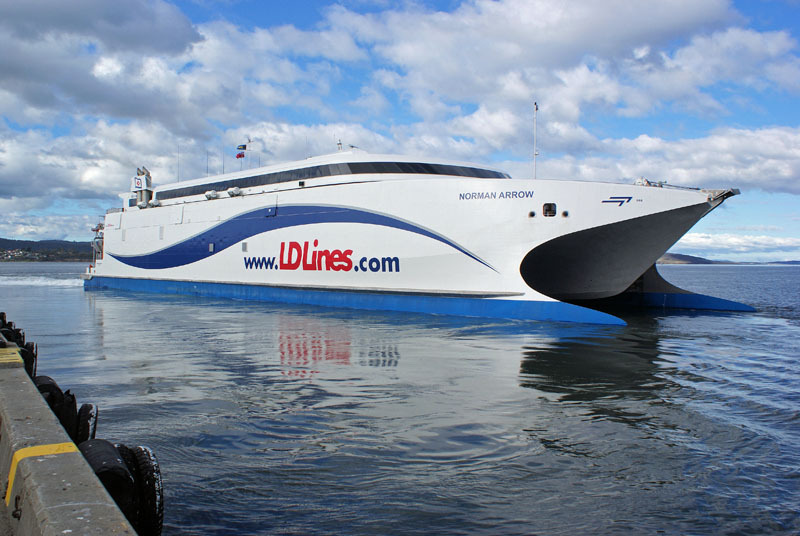 Capacity: 1200 Passengers, 417 Cars or 567 meters of freight and 195 cars. 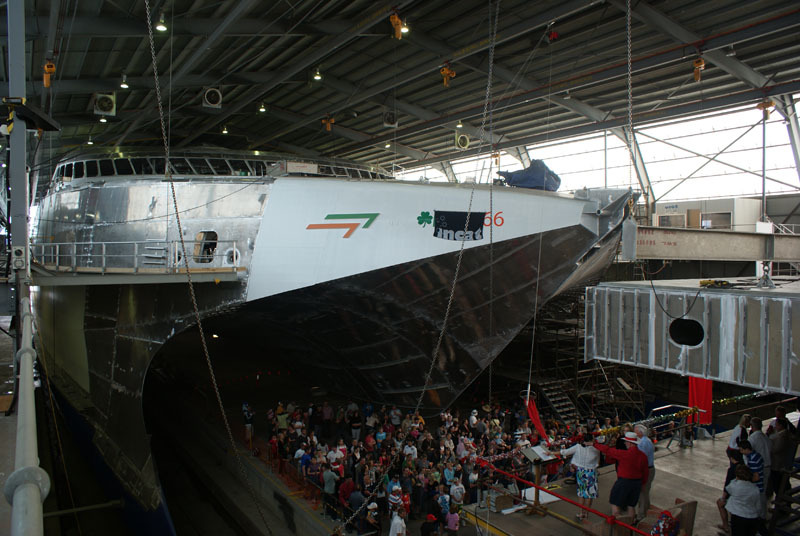 31st January 2008: Keel Laid. 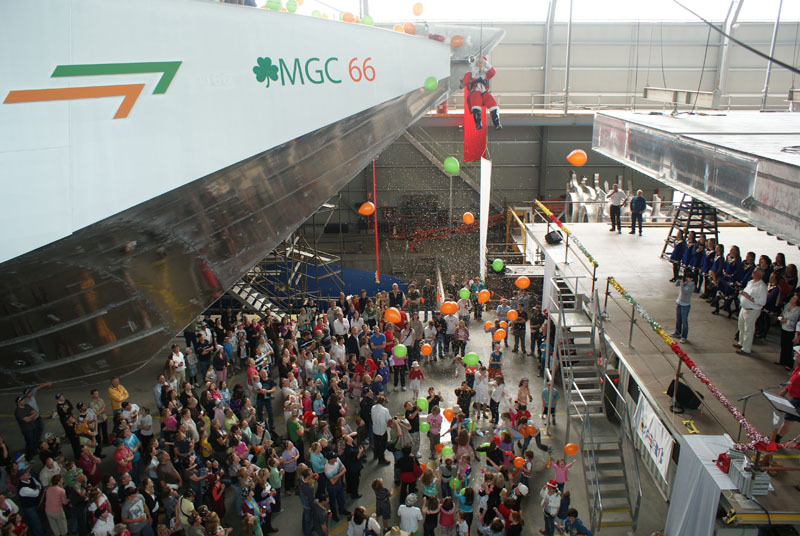 24th December 2008: Christened the ‘MGC 66’. 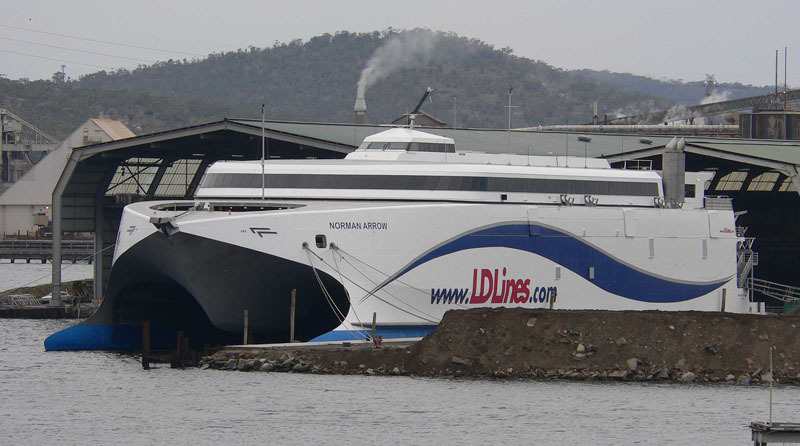 8th February 2009: Launched into the River Derwent, Hobart, Tasmania from the Wilsons covered building dock. 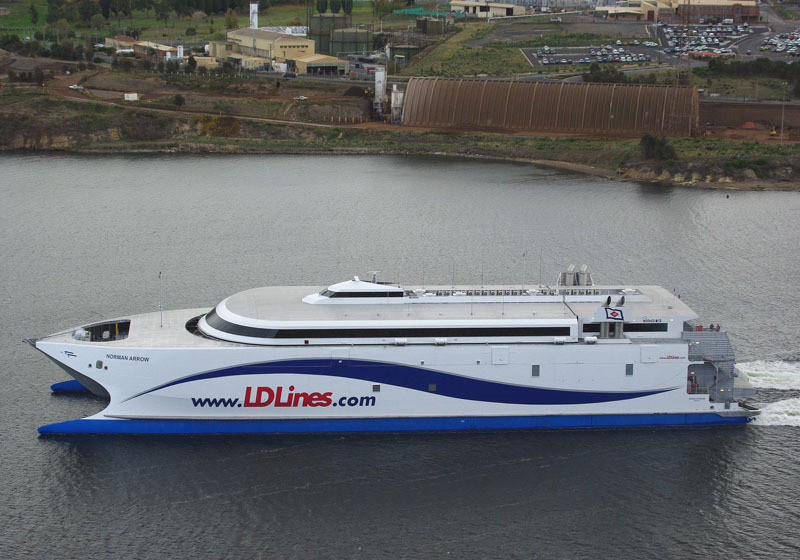 21st March 2009: Completes two days of sea trials off Hobart. April 2009: It was announced that the MGC 66 will be chartered to Louis Dreyfus Armateurs SAS (trading as LD Lines) for use on there Dover-Boulogne service. 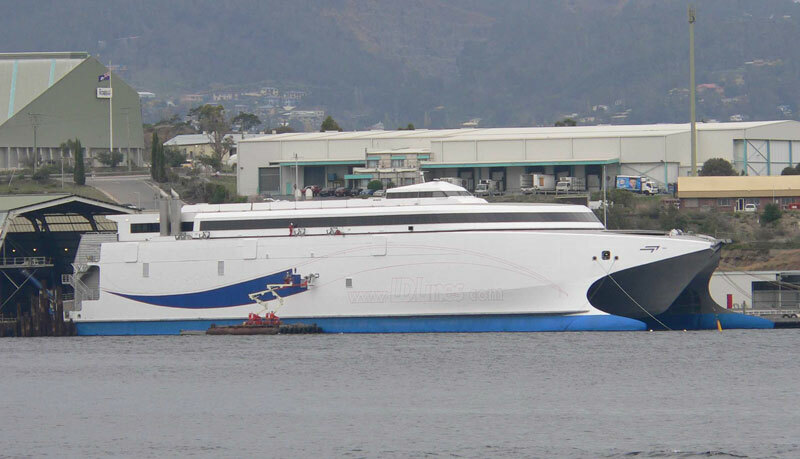 The vessel was renamed ‘Norman Arrow’. 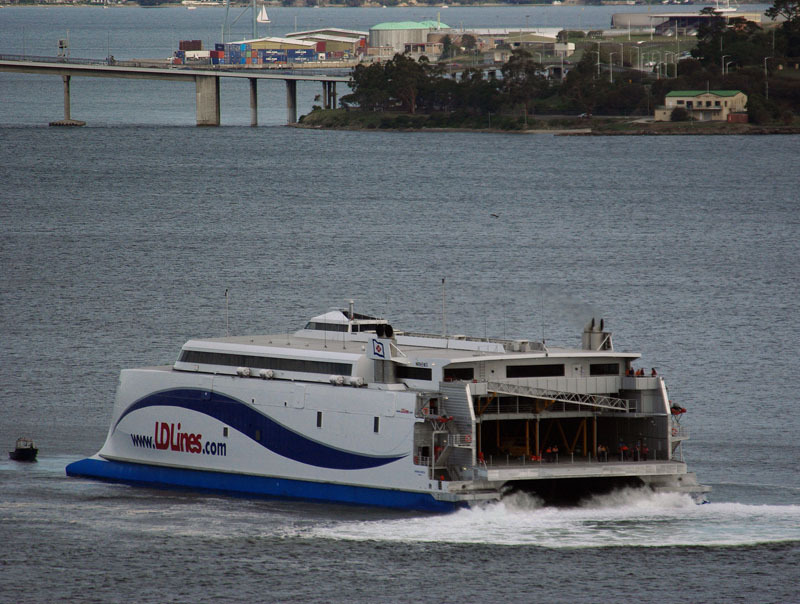 1st May 2009: Travels the short distance from the Incat yard to Self’s Point to take on bunkers. 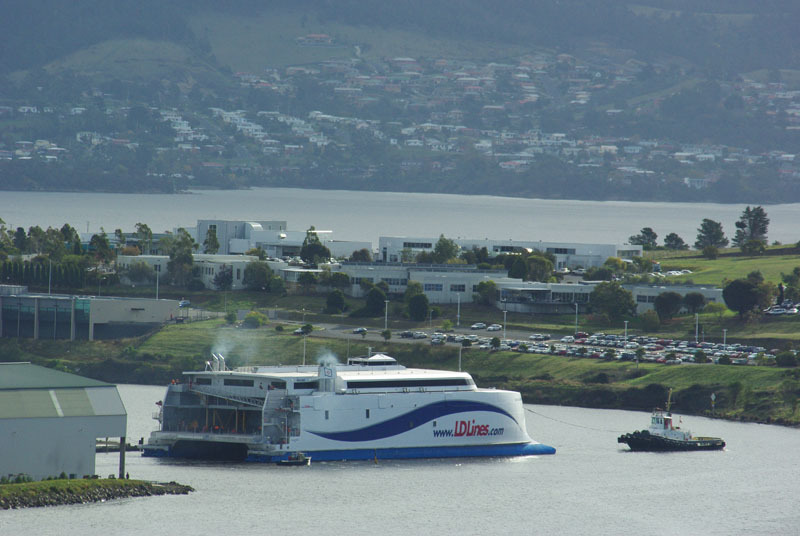 After taking on bunkers she proceeded through the Tasman Bridge to berth in the city at Macquarie No. 3. 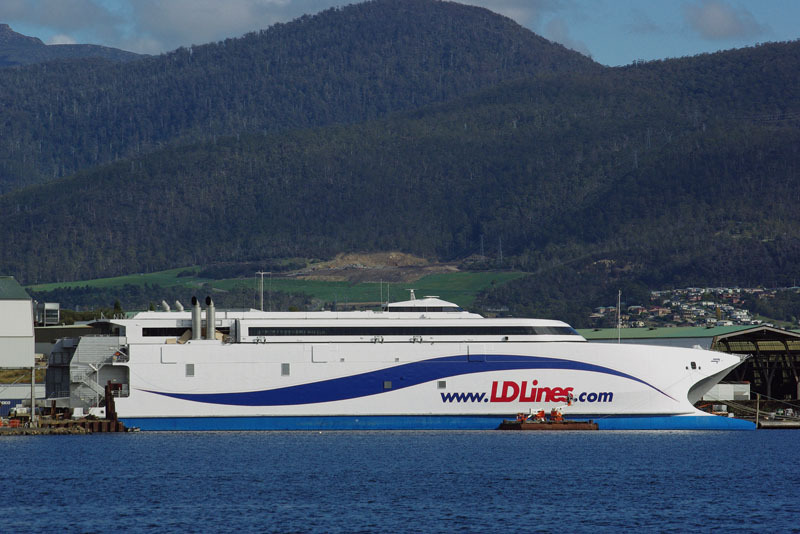 2nd May 2009: Under the command of Captain Nick Dunn, the state-of-the-art ferry departed Hobart at 18.50hrs on Saturday 2nd May at the start of an 11,726 nautical mile voyage to the English Channel. 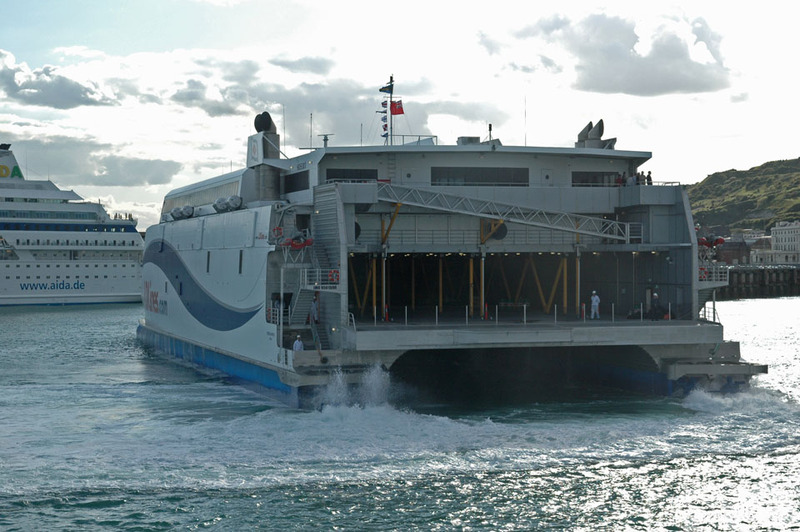 The delivery voyage takes a course via Fremantle (South Western Australia), Port Victoria (The Seychelles), the Suez Canal and Valletta (Malta), the Norman Arrow is expected to arrive in Dover and Boulogne on or around the 25th May 2009. 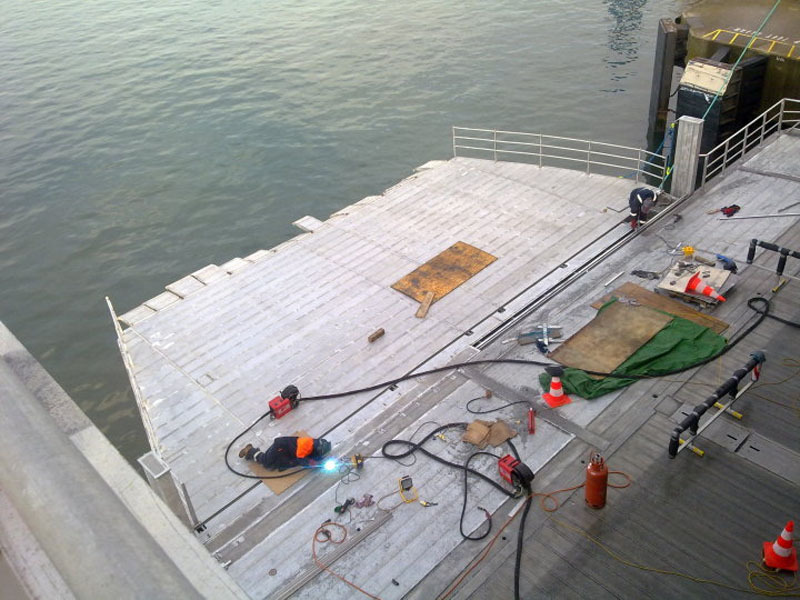 5th May 2009: Arrived in Fremantle. 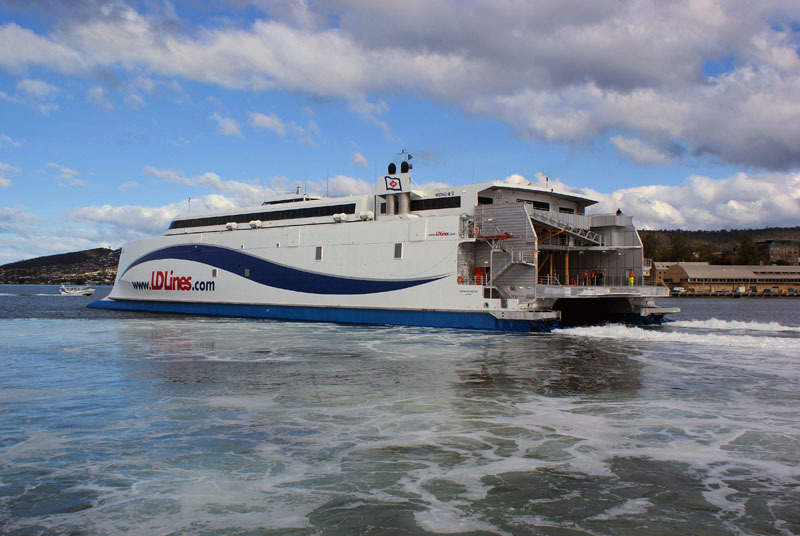 Due to a minor technical problem her departure was delayed so repairs and trials could be completed. 7th May 2009: Departed Fremantle to cross the Indian Ocean to Port Victoria, The Seychelles. 13th May 2009: Arrived in Port Victoria, The Seychelles. 15th May 2009: Departed The Seychelles for Port Suez, ETA 21st May 2009. 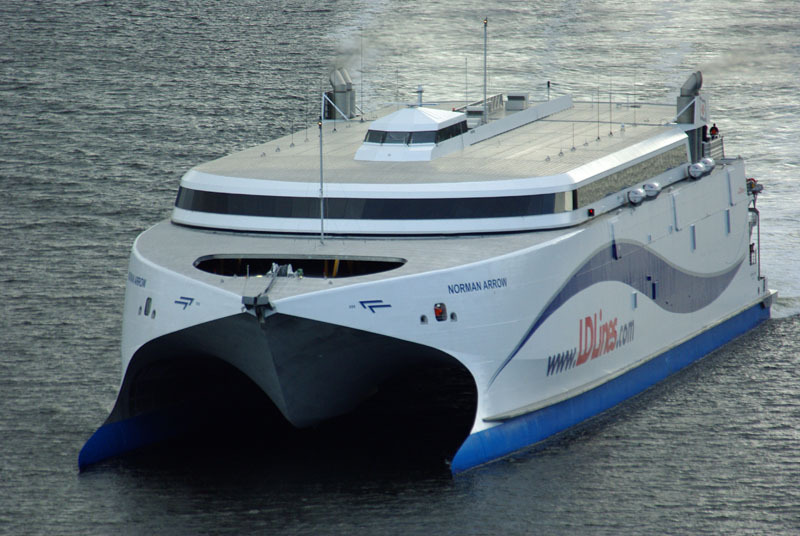 21st May 2009: Transited the Suez Canal in 14 hours. 23rd May 2009: Arrived in Malta. 24th May 2009: Departed Malta and set course for Dover. 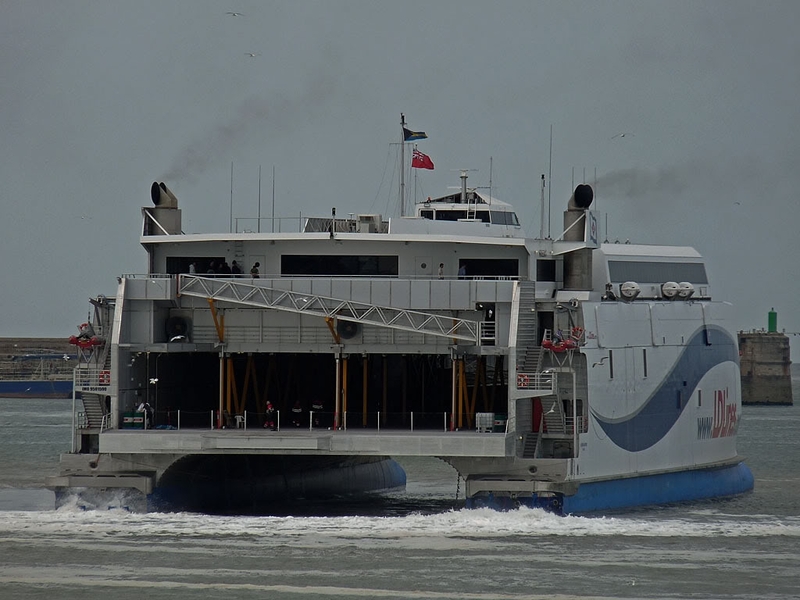 26th May 2009: Arrived in the Port of Dover at 17:00 UTC and was escorted to the Prince of Wales pier by the Port of Dover tug ‘DHB Dauntless‘. 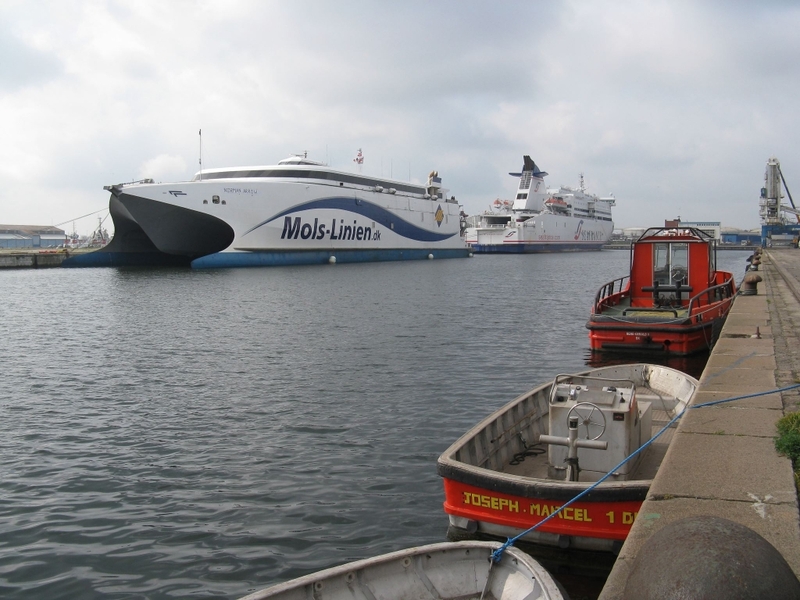 27th May 2009: Arrived in the Port of Boulogne for the first time. 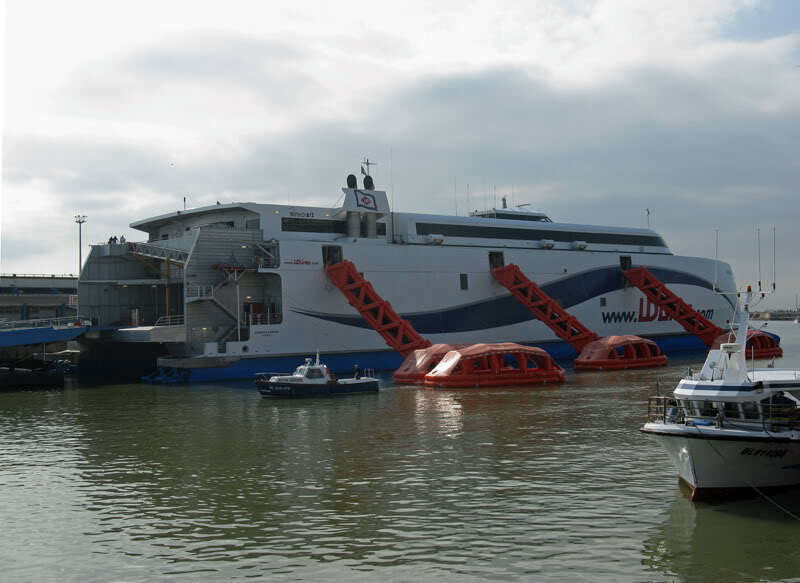 28th May 2009: Undertook safety drills alongside in Boulogne. 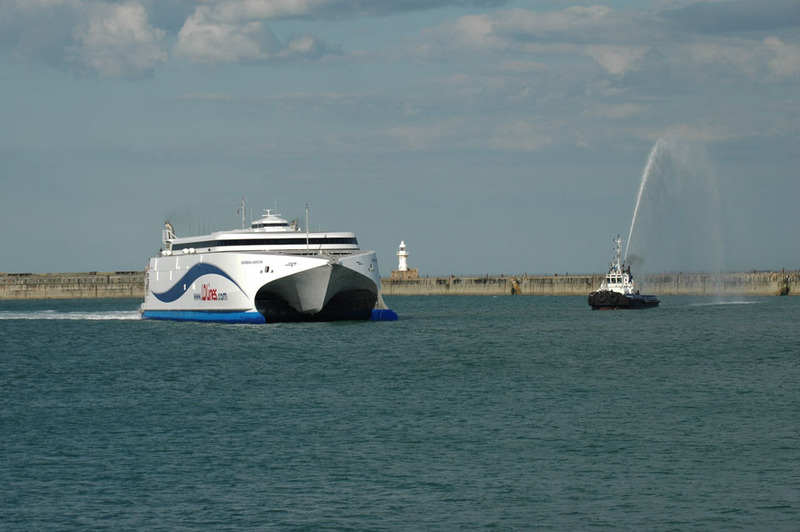 29th May 2009: Returns to Dover to be prepared for her entry into service on Saturday 6th June 2009. 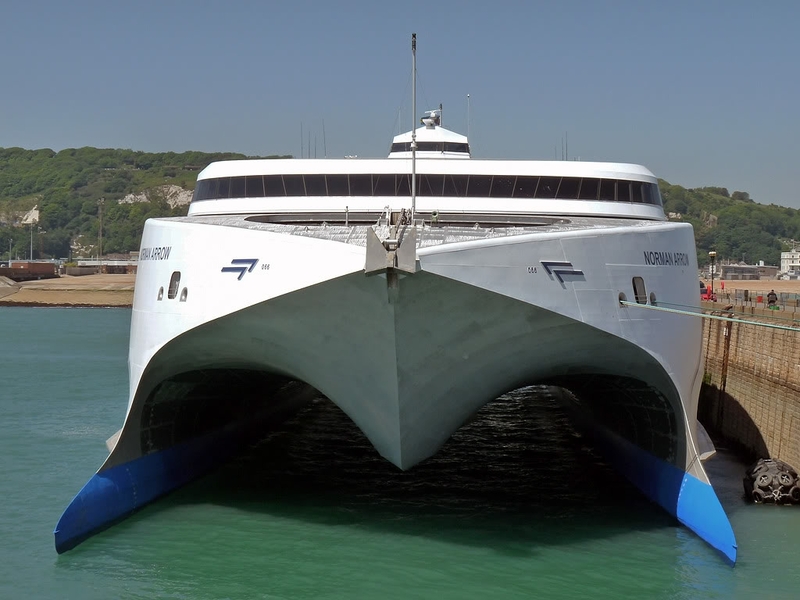 4th June 2009: Carries out berthing trials at berth 3, Dover Eastern Docks. 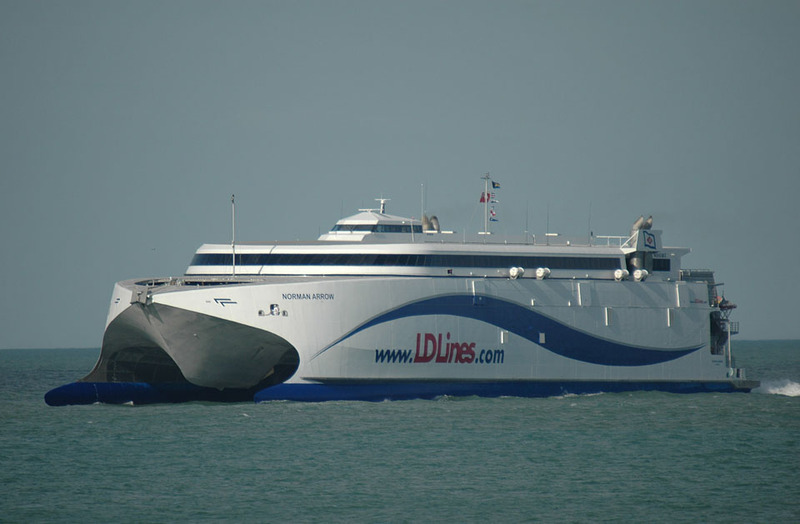 6th June 2009: Enters commercial service between Dover and Boulogne. 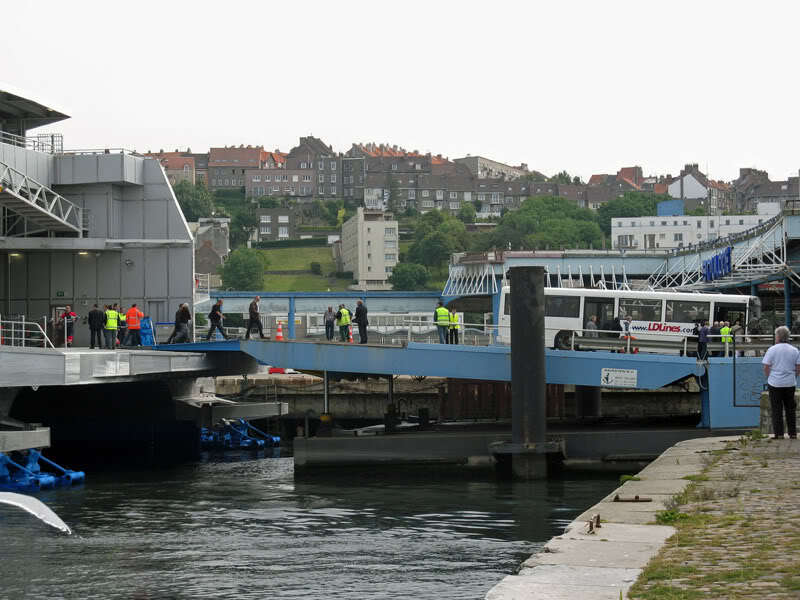 11th June 2009: French unions attempt to block the port of Boulogne. 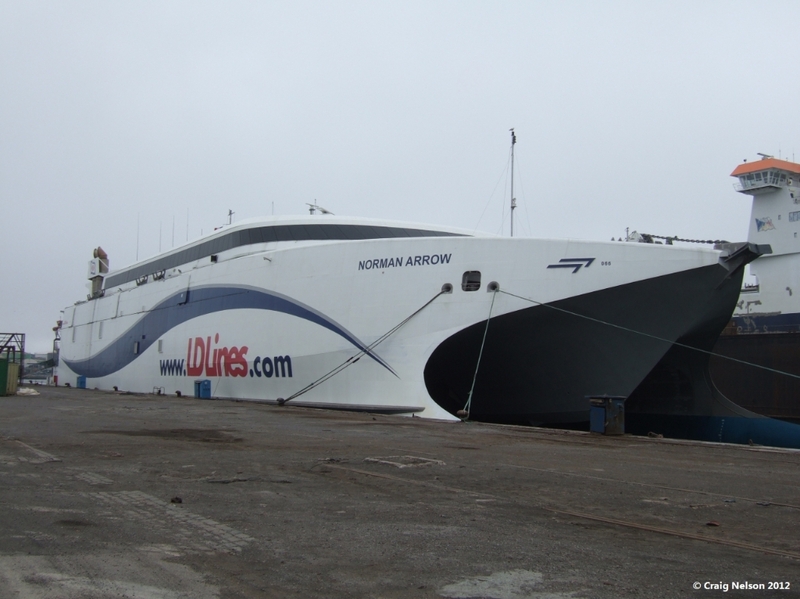 The CFDT union was protesting at the terms of Portuguese crew working on the NORMAN ARROW. 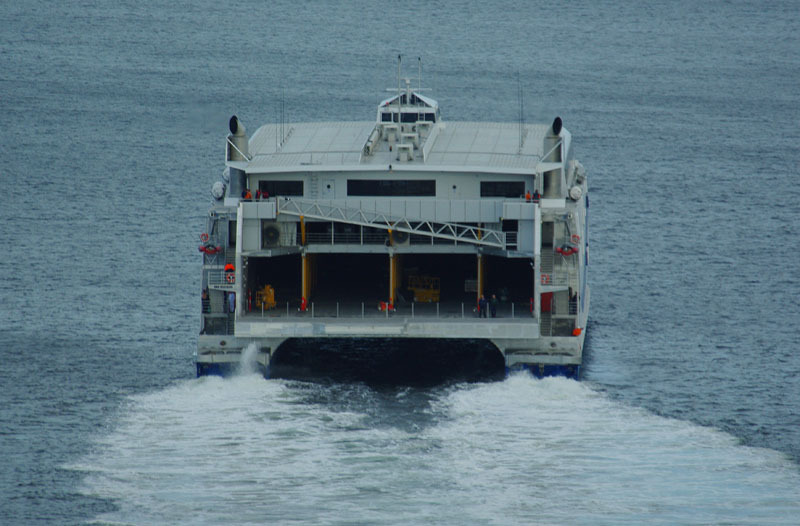 24th June 2009: Owing to some minor technical problems a couple of sailings are missed. 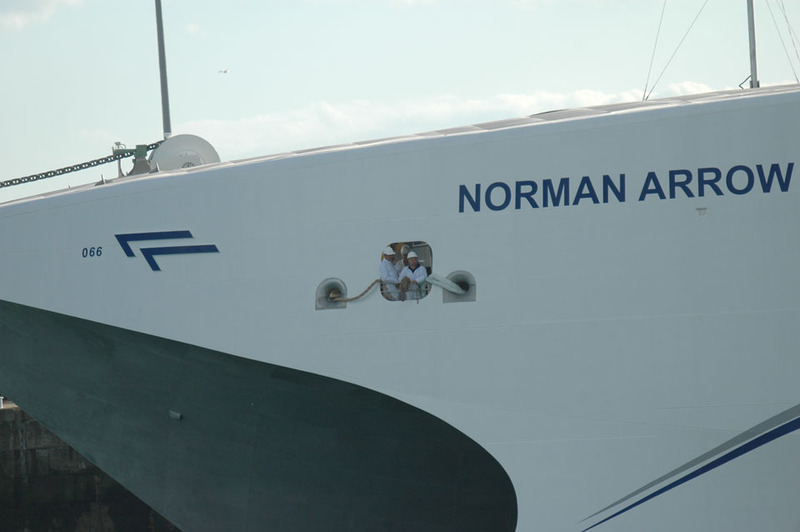 17th September 2009: The Norman Arrow starts operating from the new `hub’ port at Boulogne. 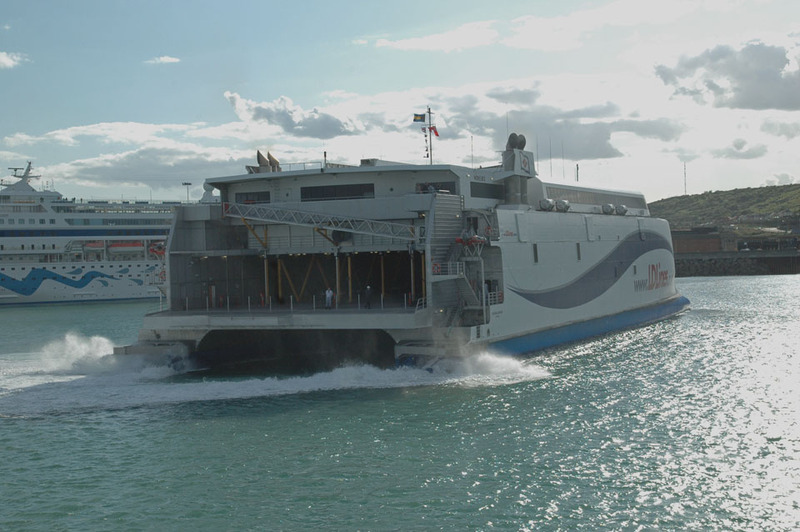 2nd October 2009: It was announced that after only 5 months of operations out of Dover the Norman Arrow is to be replaced by the Norman Spirit from Portsmouth. 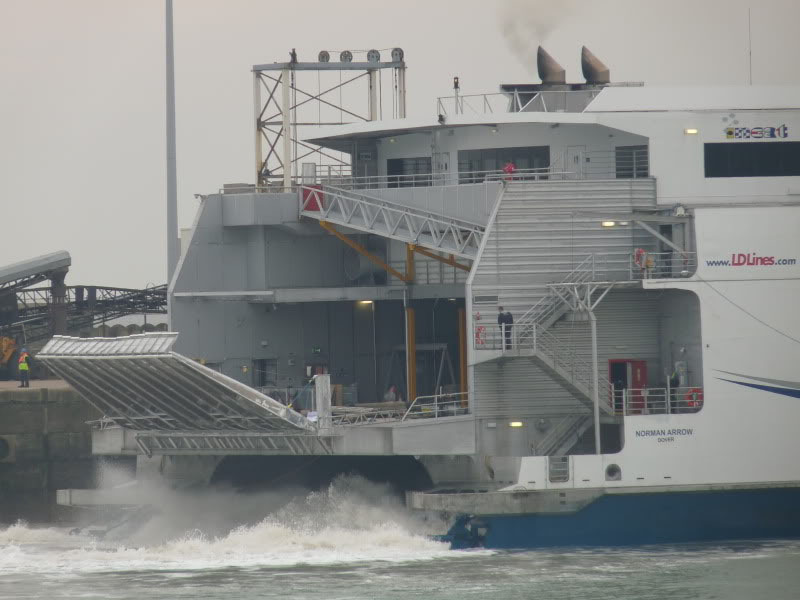 10th November 2009: Norman Arrow operates her last crossing from Dover to Boulogne. 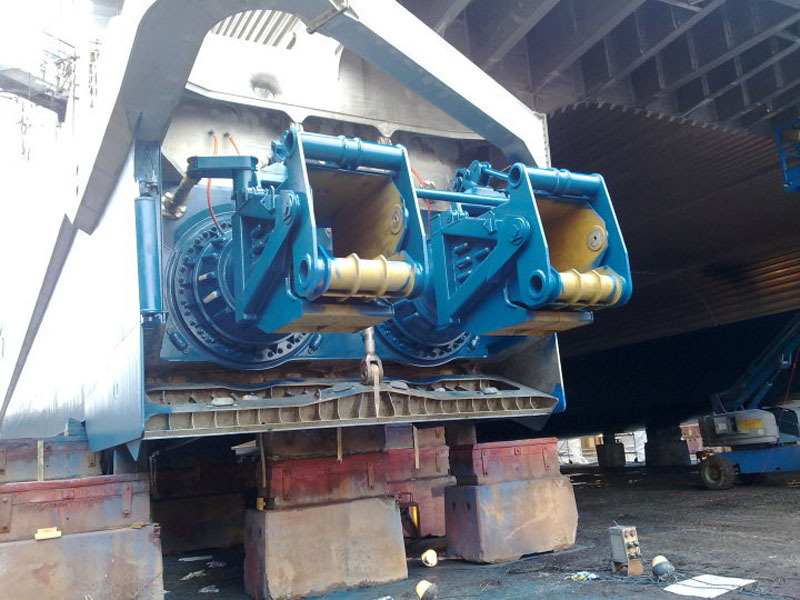 15th November 2009: Proceeds to berth 13 at the Port of Boulogne for winter layup. 14th December 2009: Departs Boulogne and undertakes berthing trials at Newhaven and Portsmouth. 15th December 2009: Undertakes berthing trials at Le Havre and Dieppe before heading back to Boulogne. 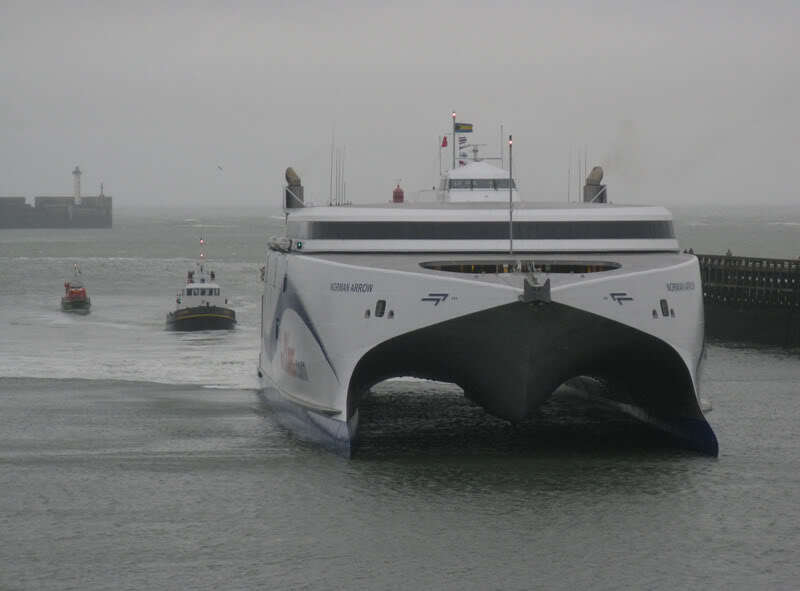 8th March 2010: Departs Boulogne for a dry docking at ARNO’s in Dunkerque. 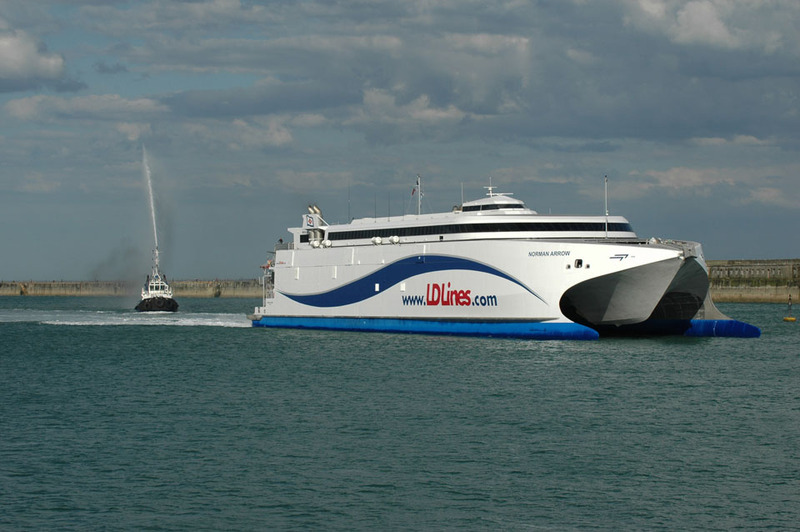 14th March 2010: Departs Dunkerque and proceeds to Dover. 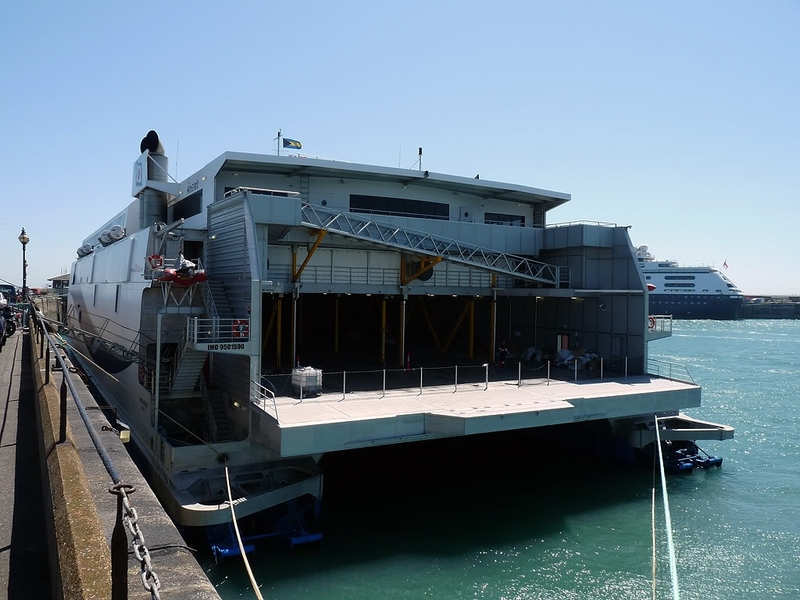 Lays alongside Cruise Terminal 1 (CT1) to be fitted with a stern ramp in preparation for her move to the Portsmouth – Le Havre route. 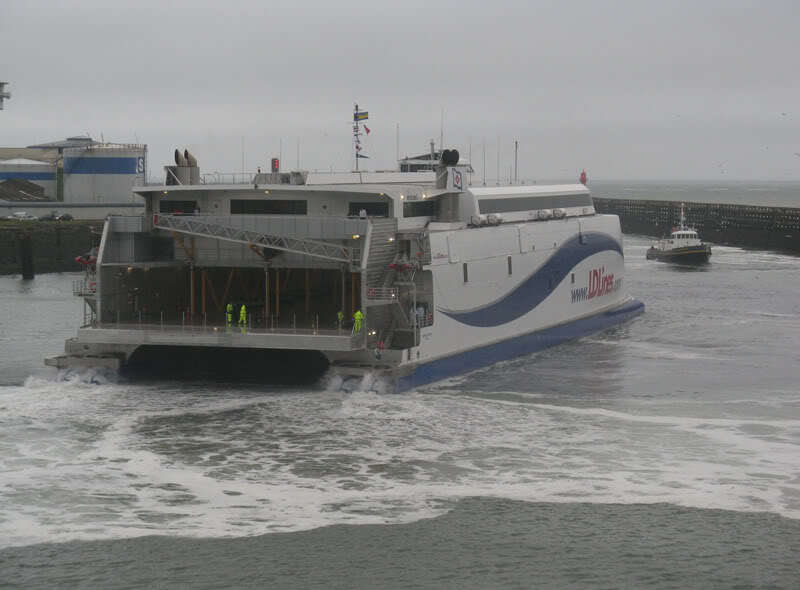 21st March 2010: Departs Dover bound for Portsmouth. 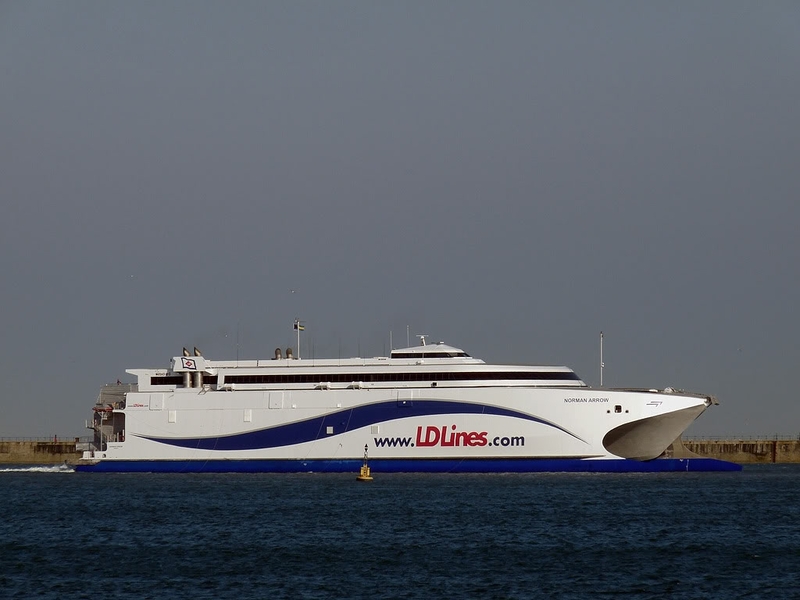 22nd March 2010: Arrives in Portsmouth and undertakes berthing and ramp trials. 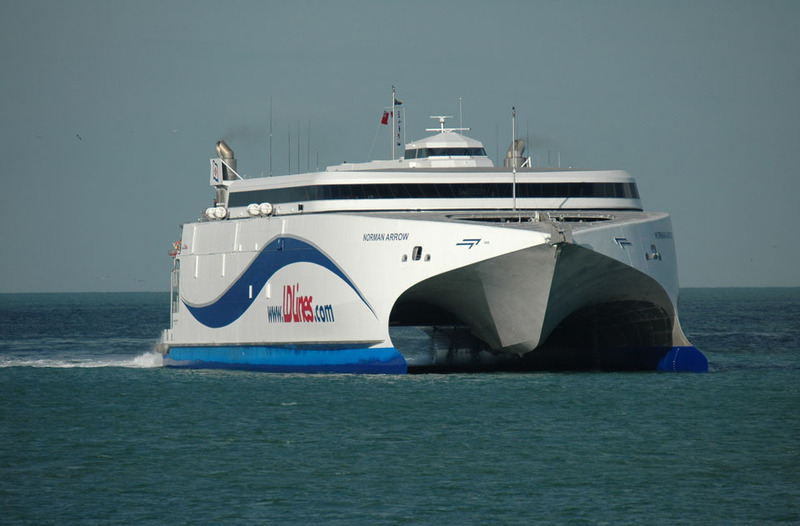 26th March 2010: Enters service between Portsmouth and Le Havre. 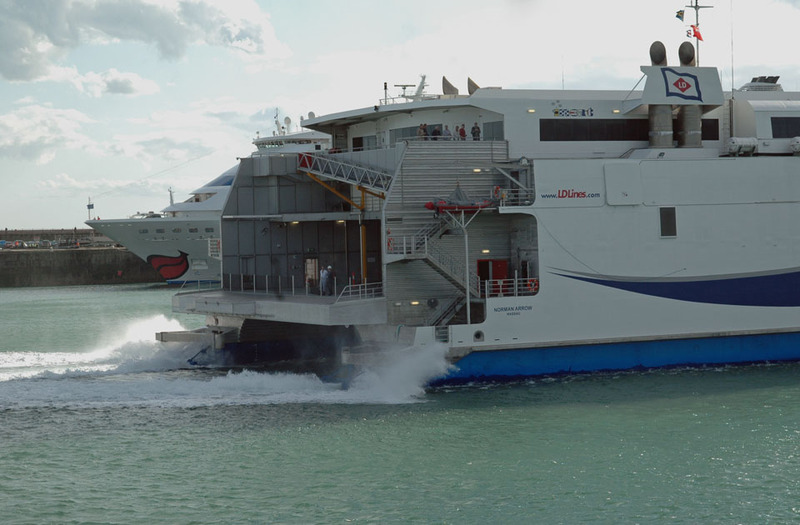 31st March 2010: Whilst manoeuvring in Portsmouth Harbour the Norman Arrow made heavy contact with a mooring dolphin damaging her starboard wave piercer. 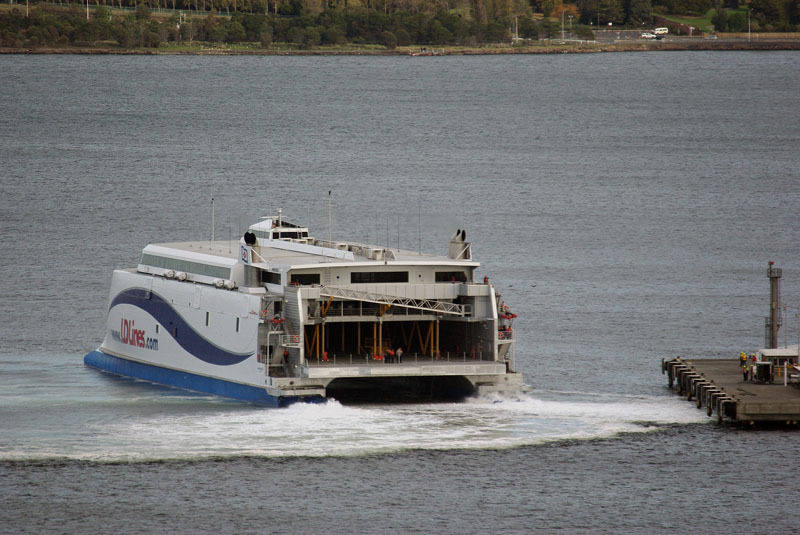 Owing to this incident all the `Arrows’ sailings are cancelled pending repairs. 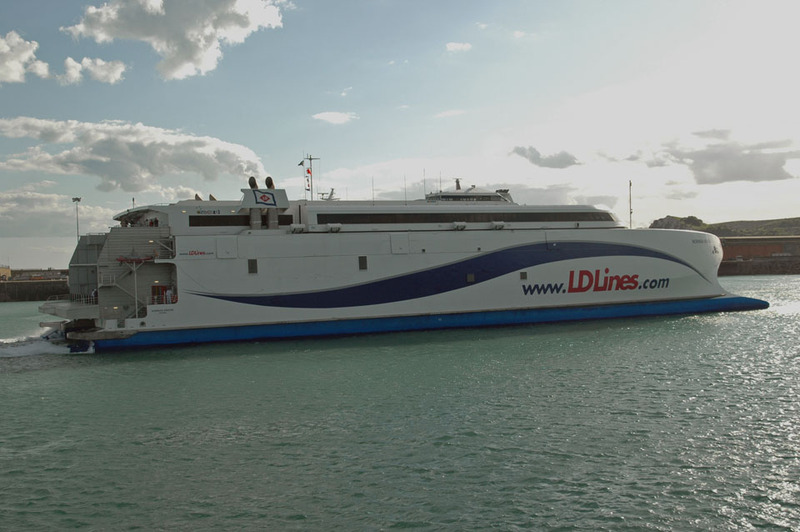 The Norman Bridge is transferred to operate the Portsmouth – Le Havre service in her place. 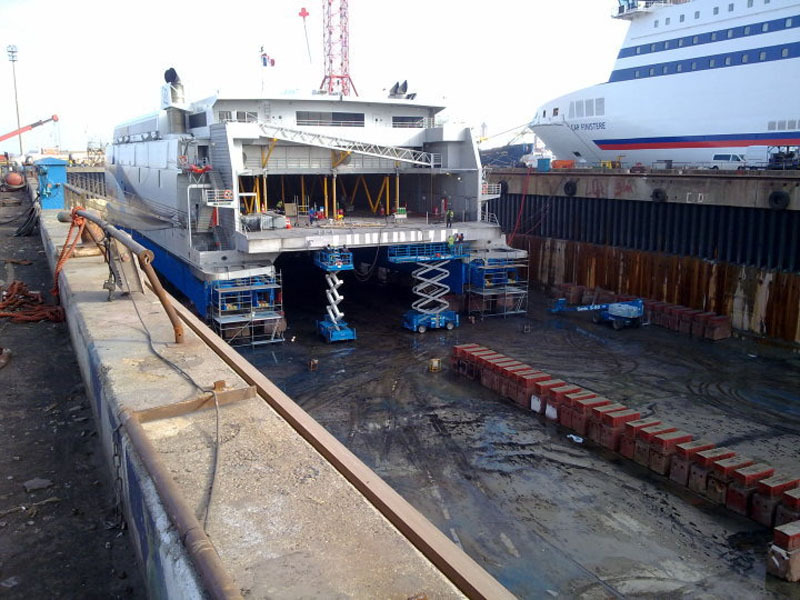 2nd April 2010: Arrives at the port of Dunkerque for repairs at ARNO’s. 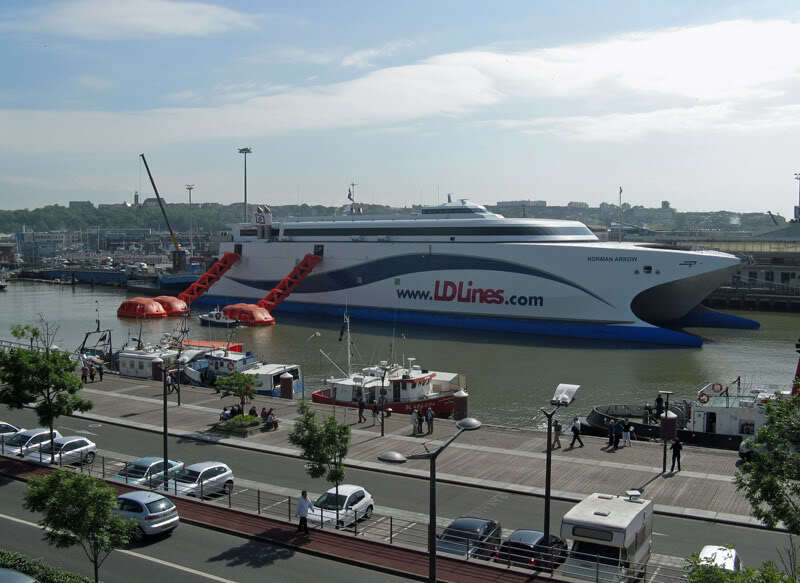 Owing to strong winds she is unable to enter the lock to Dunkerque East until early evening. 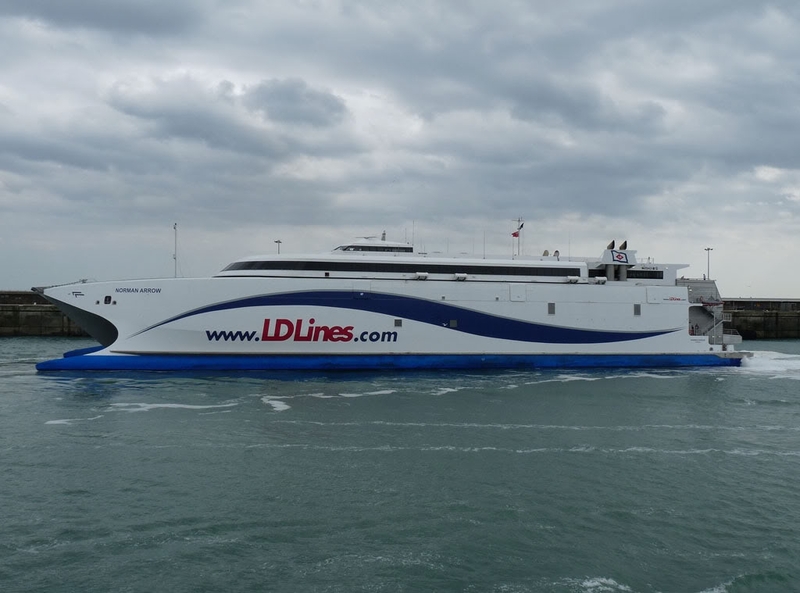 4th April 2010: Departs Dunkerque and proceeds to Boulogne. 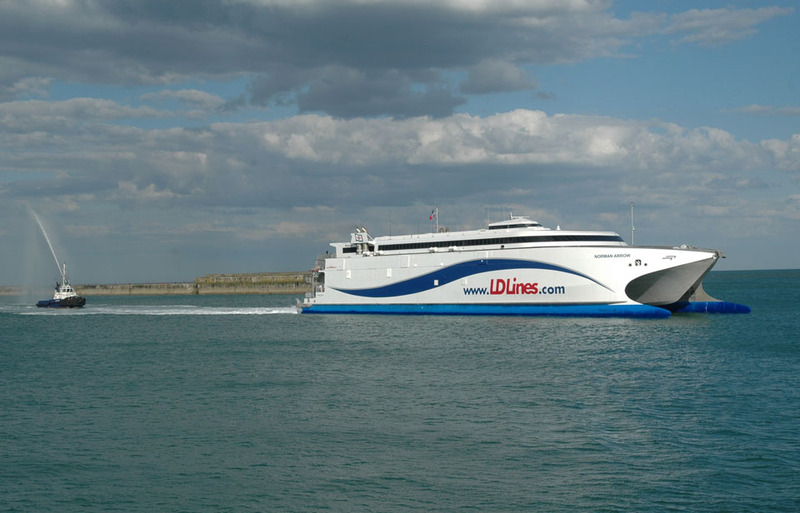 5th April 2010: Departs Boulogne for Le Havre to take up the 18:30 departure to Portsmouth. 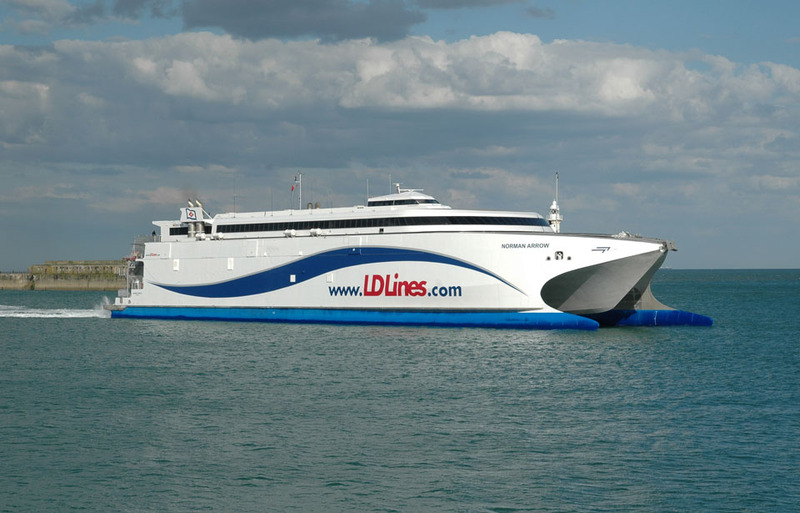 July 2010: It was announced that the Norman Arrow’s operations out of Portsmouth are to be extended until October 2010. 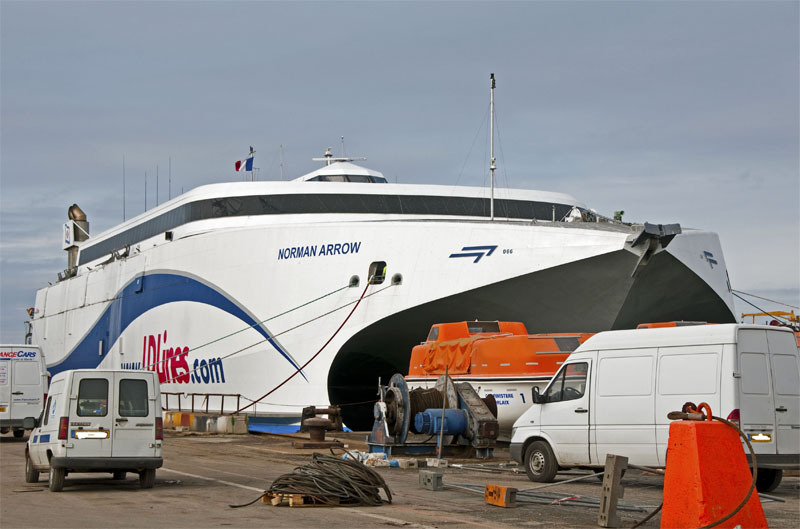 29th August 2010: It was reported that whilst manoeuvring in Le Havre the Norman Arrow made heavy contact with a berth pile. 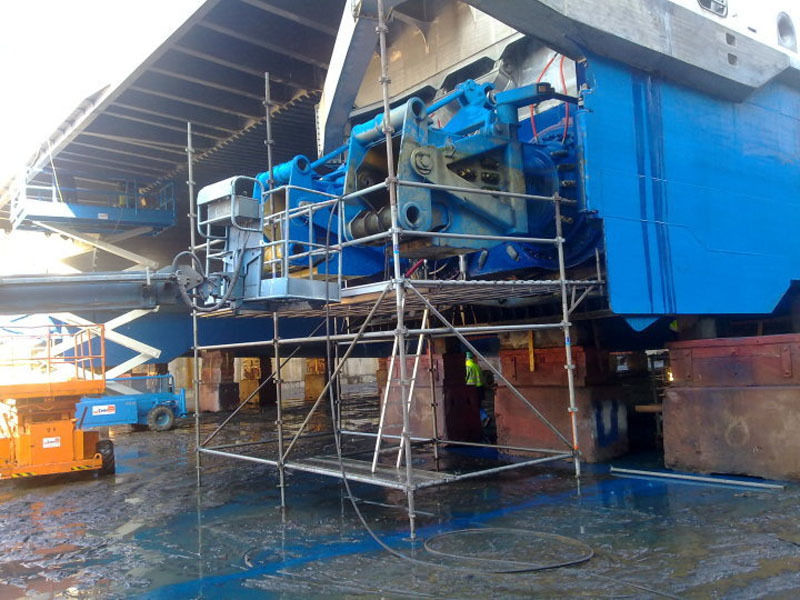 This collision resulted in numerous holes in the shell plating of one her engine rooms which allowed seawater ingress leaving her with a flooded engine and gearbox. 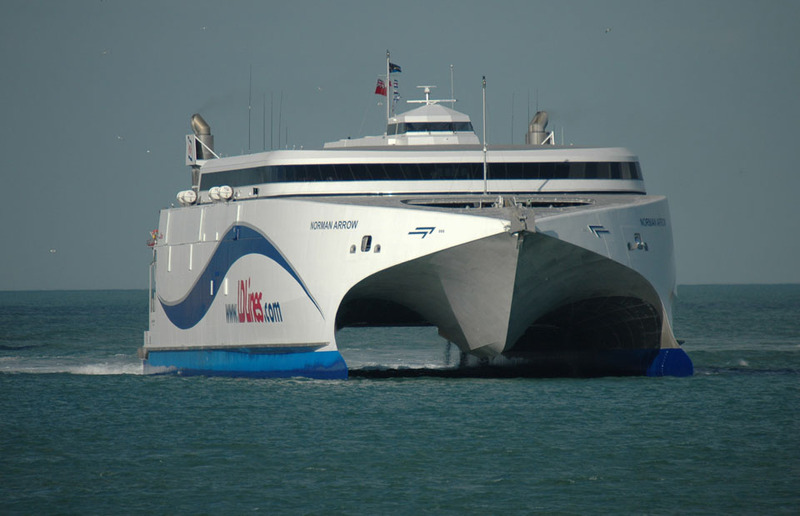 18th September 2010: Departed Le Havre for Cherbourg. 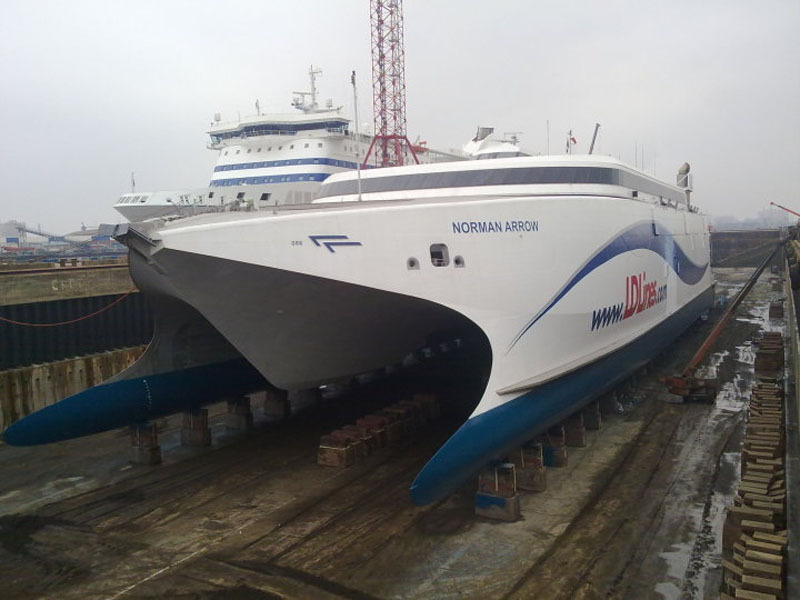 Eventual destination is Brest for repairs at the Sobrena Shipyard. 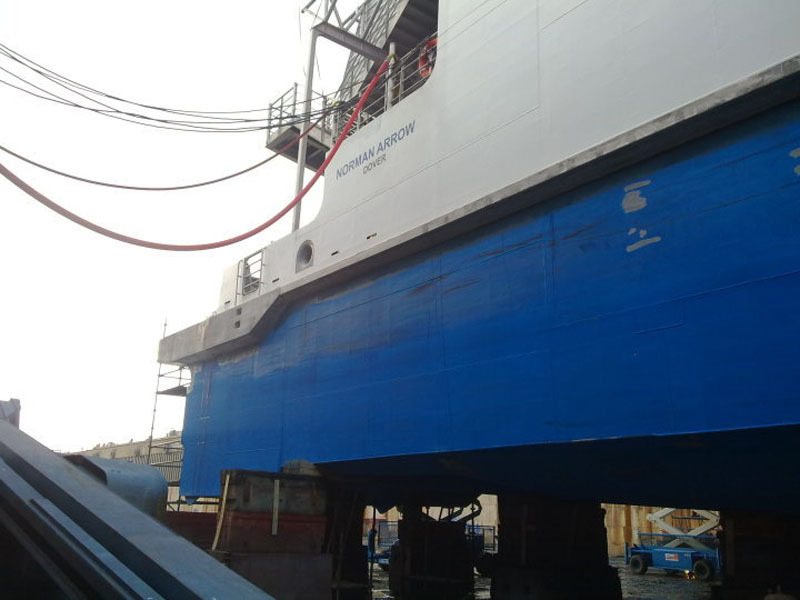 Upon completion of repairs the vessel is to be laid up for the Winter. 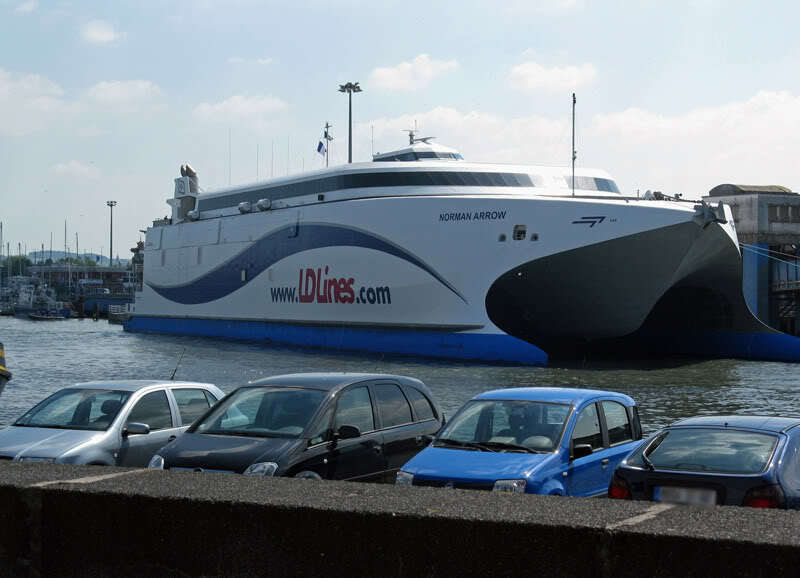 20th September 2010: Arrives in Brest, France for repairs. 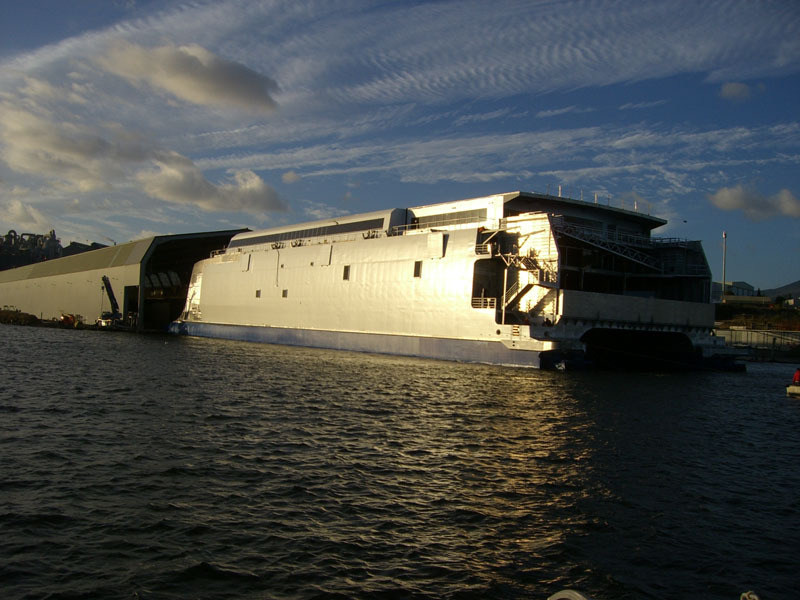 October 2010: Following repairs she was laid up in Brest. She returned to service from Portsmouth in June 2011. 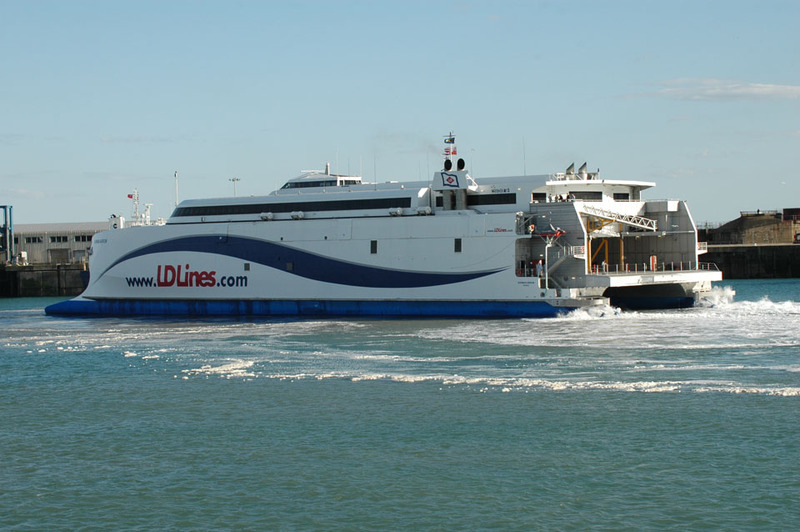 September 5th 2011: Finishes service between Portsmouth and Le Havre. 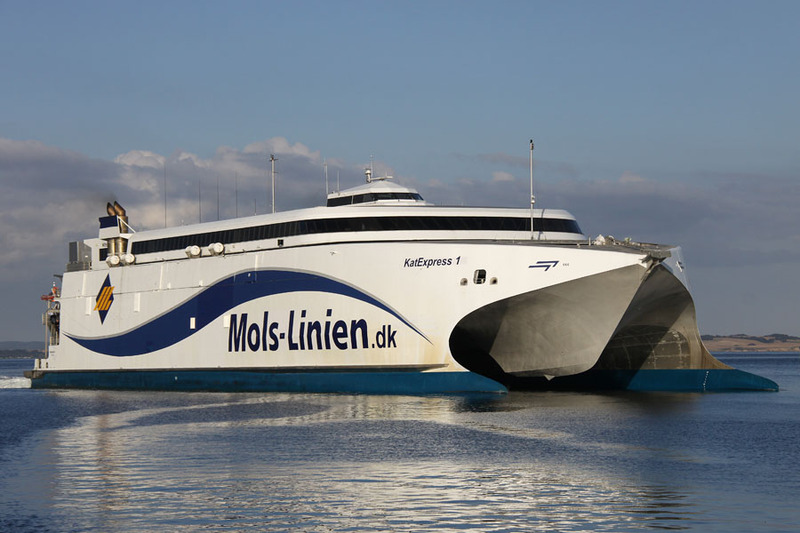 February 8th 2012: Mols Linien A/S announced that it had entered into an agreement to charter a fast ferry, Norman Arrow, for a 10-year period. 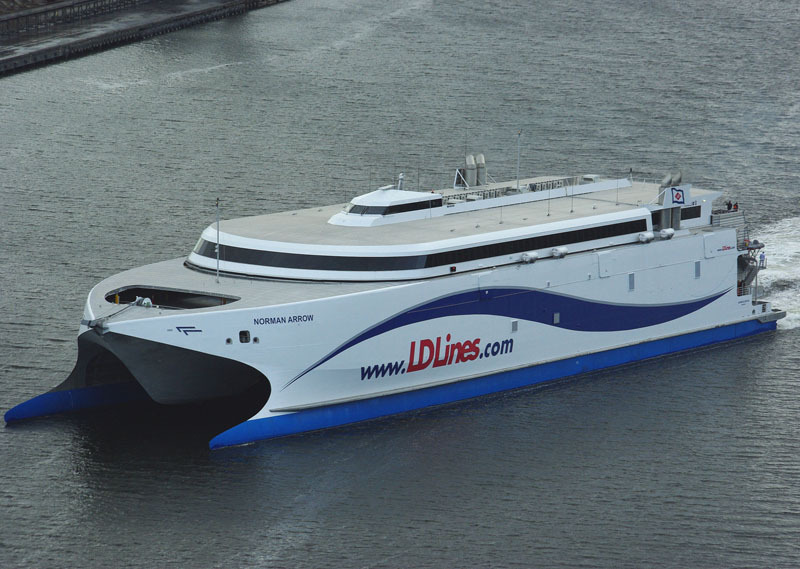 The charter agreement was reached with O66 Fast Ferry Leasing Limited, headquartered in Dublin, Ireland. 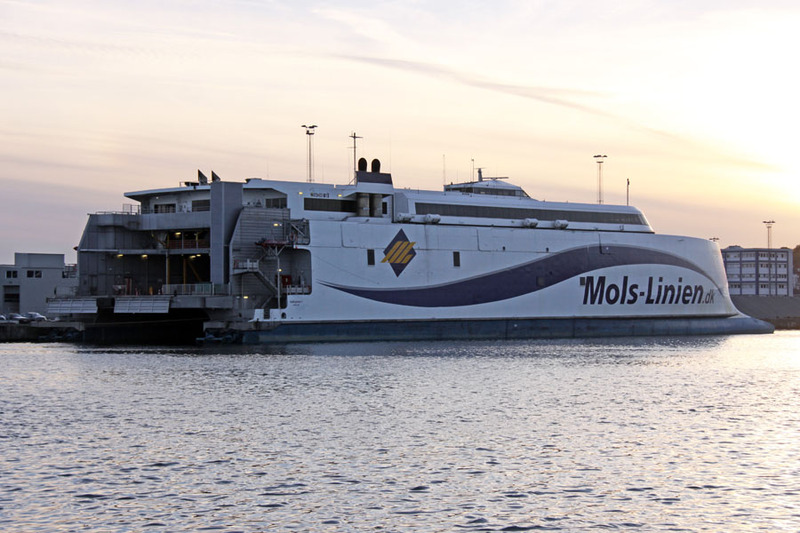 It was announced that she would be deployed on the route between Sjaellands Odde and Aarhus, and on the route between Sjaellands Odde and Ebeltoft. 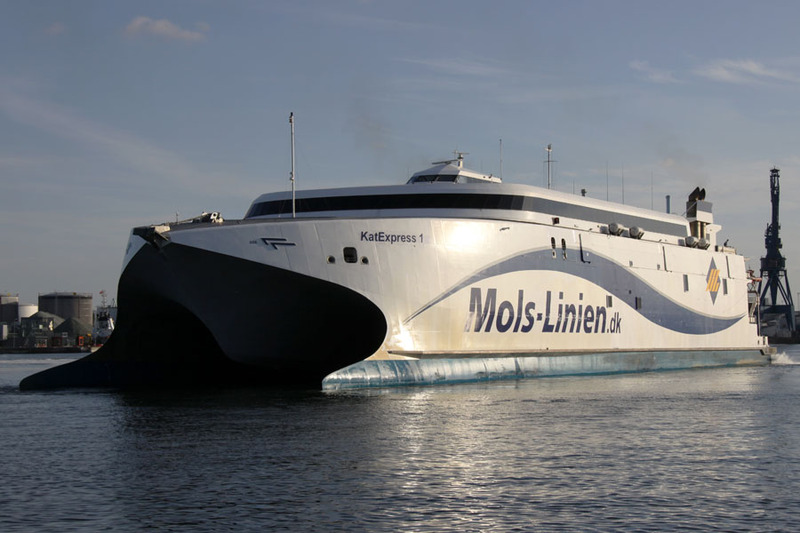 March 24th 2012: Arrived at ARNO Dunkerque for refit prior to her charter to Mols Linien. 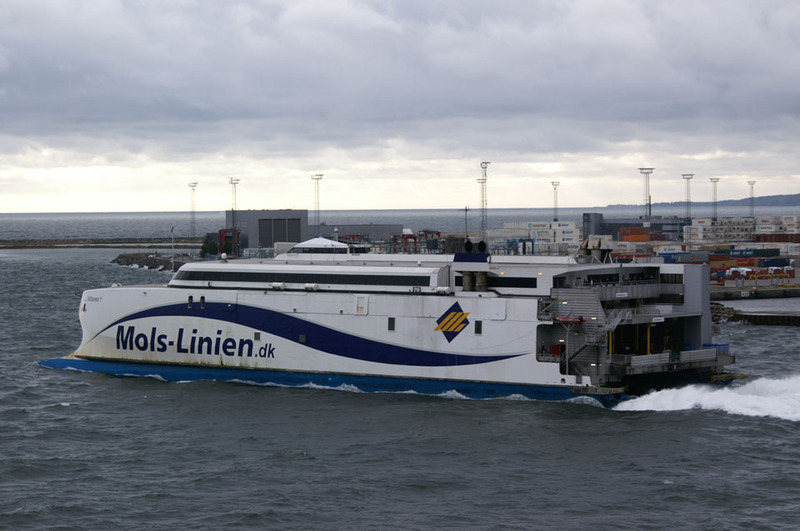 April 26th 2012: Departed Dunkerque for Aarhus, Denmark. 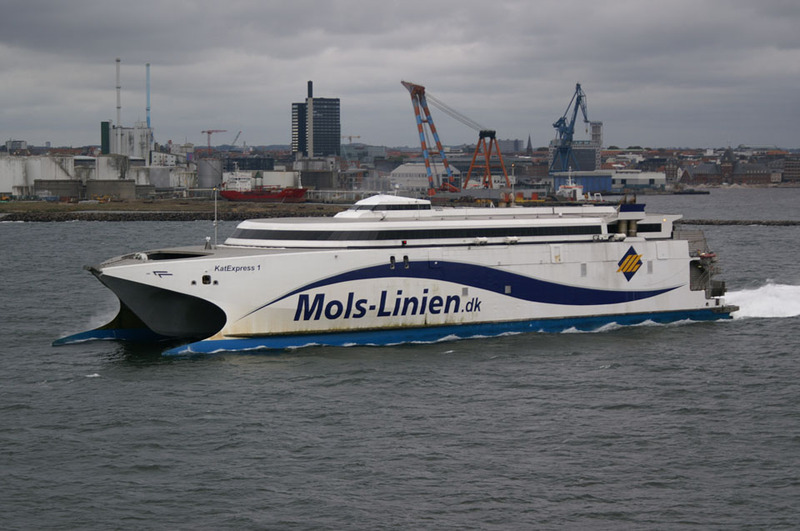 April 27th 2012: Arrives in Aarhus for extensive trials before entering service. 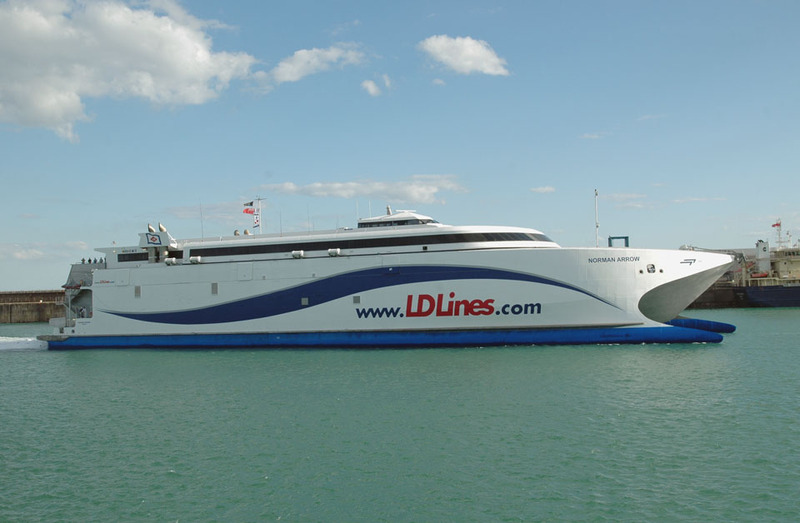 April 30th 2012: Renamed KATEXPRESS 1 . 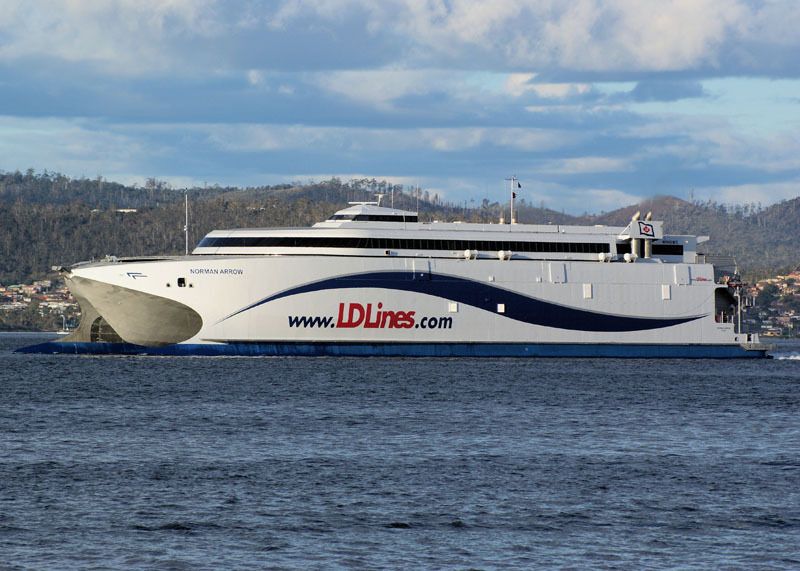 May 17th 2012: At weekends also served Själlands Odde – Ebeltoft. 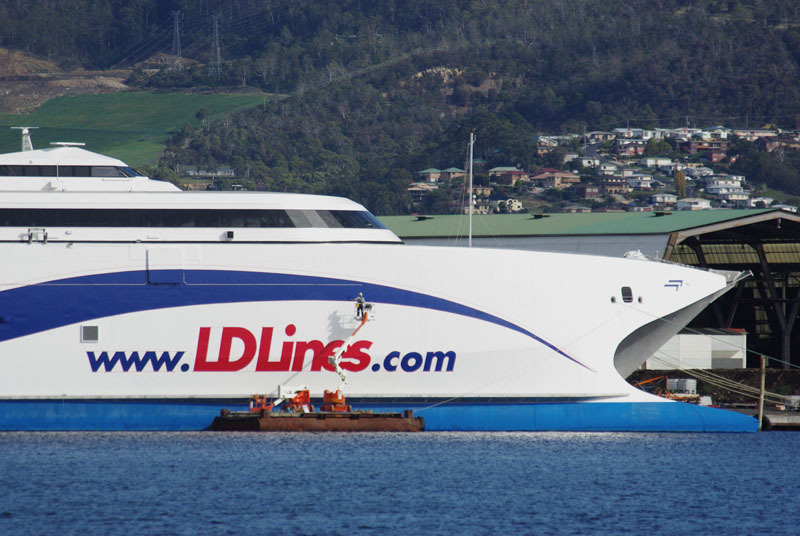 January 2017: Renamed EXPRESS 1. October 20th 2017: Collided with quayside in Själlands Odde. 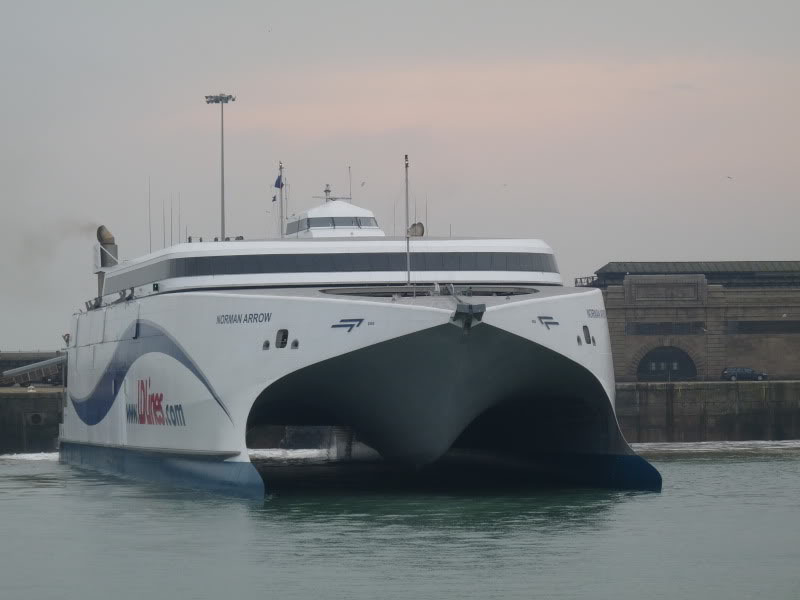 No reported injuries and she was taken out of service for repairs. November 1st 2017: Returned to service. November 20th 2017: Arrived at Örskov yard, Frederikshavn for refit. January 13th 2018: Arrived at Arhus. January 15th 2018: Services between Århus – Själlands Odde. 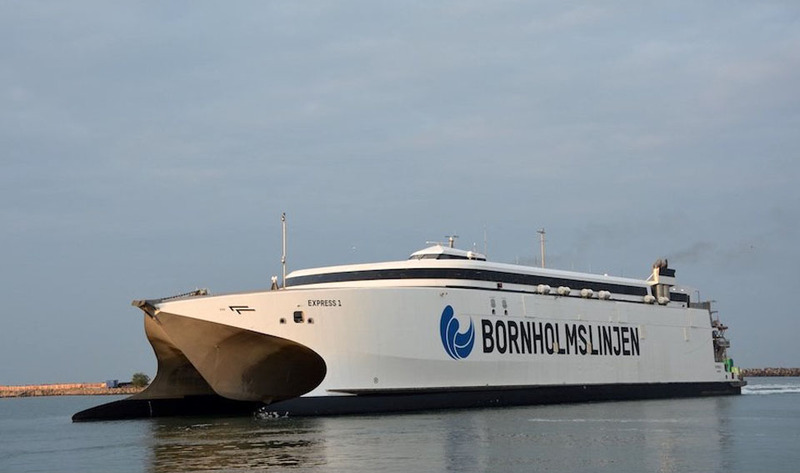 May 1st 2018: Left Århus for Frederikshavn to have “BORNHOLMSLINJEN” painted on her hull. May 15th 2018: Returned to service. 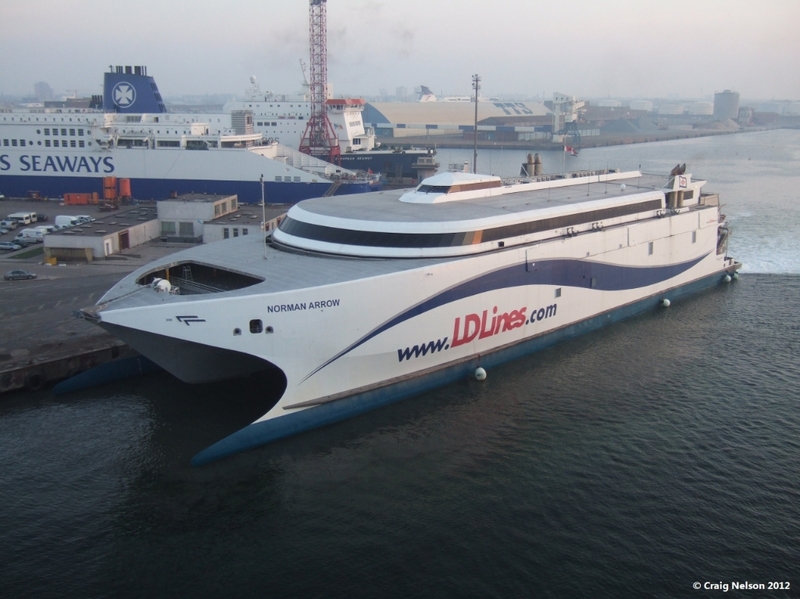 August 20th 2018 – August 21st 2018: Trials between Rönne – Ystad before entering service. All information is believed to be correct and no responsibility is accepted for any errors or omissions found. All items included in this article are subject to © copyright. 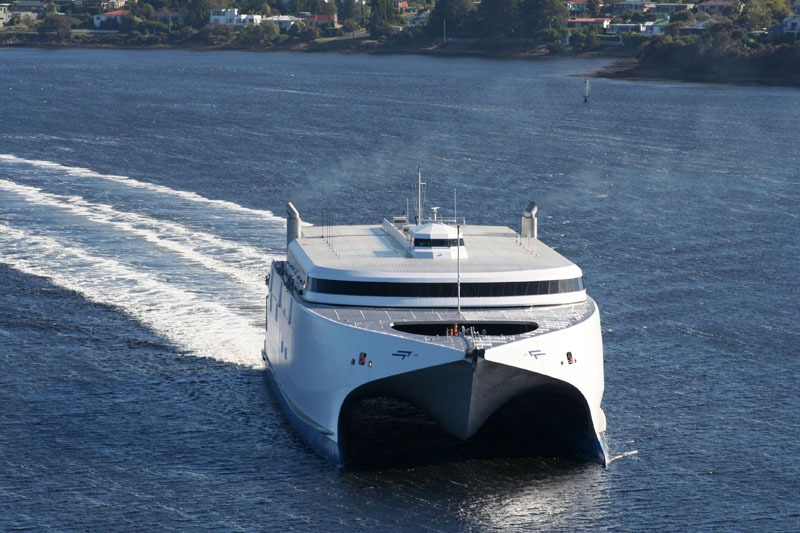 We would like to take this opportunity of thanking: Bill `Tassie’ Burton (Ships Nostalgia), Kim Clifford (Incat Tasmania Pty Ltd), Martin Donnelly, Robert Fournier, Jean-Guy Hagelstein, Pieter Inpyn, Mike Jackson, Justin Merrigan, Craig Nelson, Walter Pless, David Roberts (Incat Tasmania Pty Ltd) and Andreas Wörteler for their assistance in compiling this feature.